WATCH: CHIEFS FANS TURN VIOLENT AND DESTROY STADIUM! 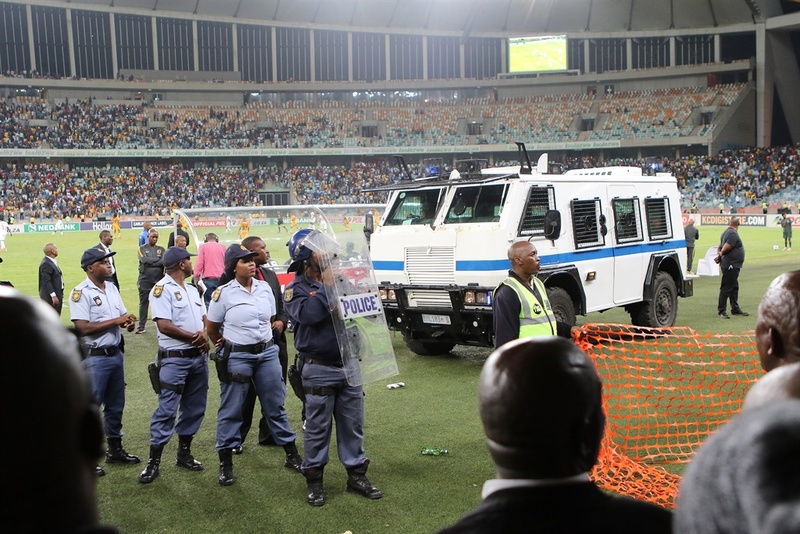 Violent scenes broke out shortly after the final whistle blew in the Nedbank Cup semi final match between Kaizer Chiefs and Free State Stars at the Moses Mabhida Stadium in Durban last night. With all their hopes of silverware dashed, some Chiefs supporters could not contain their frustration and anger and quickly stormed the field of play leaving a path of destruction. Security guards were brutally attacked, parts of the stadium were damaged and some media equipment was destroyed while the players and technical staff from both teams ran for their lives. Police were forced to use tear gas and stun grenades in their attempts to defuse the situation. The 2-0 defeat would be Coach Steve khompela’s final game in charge of the Amakhosi as he immediately announced his resignation following the chaotic scenes. The Pandemonium caused by Chiefs supporters last night comes after three frustrating trophy less seasons under the guidance of Khompela. Chiefs were recently fined R250,000 for throwing foreign objects onto the field after their 3-0 thrashing at the hands of Chippa United in a league game. The unacceptable behaviour displayed by the disgruntled supporters last night is sure to land the club in even more trouble. Shocking! ?? Female security guard attacked during violent stadium invasion at the Moses Mabhida stadium, Durban. ???? Let's find them, call them out and report them! ??? ?#NedbankCup semi-final, Kaizer Chiefs vs Free State Stars. Absolutely diabolical scenes at Moses Mabhida Stadium tonight. Kaizer Chiefs will be in big trouble for this. Unacceptable from the supporters. This is how players left the field at Moses Mabhida stadium. Some of the ugly scenes that unfolded at Moses Mabhida Stadium last night after the #NedbankCup semifinal between Kaizer Chiefs and Free State Stars.